If you’re in the market for a new pickup truck, then you’re presumably aware of how impressive the 2017 Ford Silverado is. Thanks to its features and capabilities, drivers will be hard pressed to find a better driving experience elsewhere. Who wouldn’t want to take their pickup’s sportiness to a whole new level? 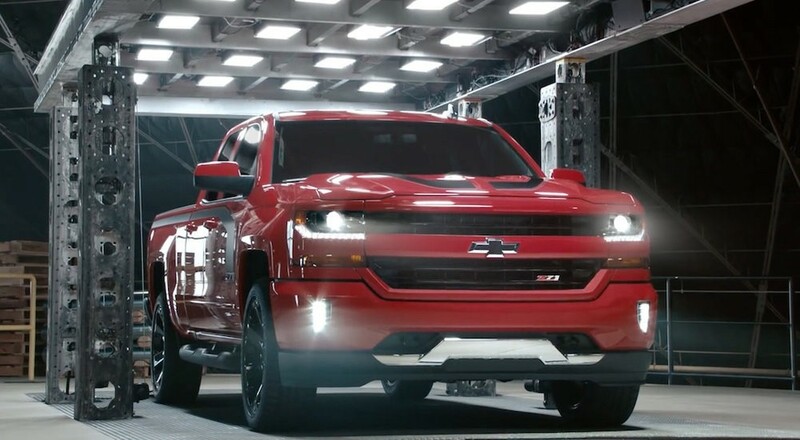 By opting for the Silverado Redline Edition, customers will be purchasing one of the most athletic trucks in the entire segment. Available on the LT Z71 double cabs and LTZ Z71 crew cabs, the majority of this package’s additions will impact the truck’s looks. For instance, engineers include their intimidating 20-inch black wheels with red accents, and they also included the surprisingly striking red tow hooks. Meanwhile, the bowties, mirror caps, grille, headline trim, and front/rear backup are painted black, which proved to be the perfect contrast to the red. To top it off, the brand included their signature black Silverado badge. Of course, the additions aren’t purely cosmetic. Rather, engineers included off-road assist steps, making it incredibly easy to access your cab or bed. The brand also added a spray-in bedliner, which will prevent the body from getting all scratched up by your equipment. If you found yourself reading about the Silverado Redline Edition and thought “hm, I’d prefer this edition if it didn’t include the red accents,” then the Silverado/Silverado HD Midnight Edition is the perfect choice for you. Accompanied by the Z72 Off-Road Package, this variant of the Silverado will transform the pickup into one of the most intimidating vehicles on the road. The vehicle is adorned in all-black features, including the brand’s bowtie emblems, the door handles, mirror caps, and the 18-inch wheels. The brand even included the Goodyear Wrangler DuraTrac off-road tires, meaning owners can easily take this intimidating behemoth off the beaten path. The Midnight edition of the 2500HD sees essentially the same additions as the regular package, including black 18-inch wheels, bumpers, grille, and badging. The major difference in this particular model is the addition of the spray-in bedliner. Are you hoping that your new Silverado will stand out from the crowd? Do you want your fellow drivers to be gawking as you drive by? In that case, you’ll want to opt for the incredible Rally Editions, which will transform your pickup into one of the sportiest vehicles on the road. The “Rally 1” edition includes a number of athletic amenities, including the traditional “rally striping” on both the hood and sides of the truck. Engineers also included their giant 20-inch black wheels, meaning the truck’s performance will confirm its sporty look. This specific version of the Silverado is available on a custom model version of the Double Cab. Meanwhile, the “Rally 2” edition takes the wheel options to a new level, as the brand offers 22-inch gloss black wheels. Since this addition will presumably boost the height of your truck, owners will also appreciate the inclusion of the four-inch round assist steps. Drivers will have access to this specific edition when the opt for the LT Z71 models with Double Cab or Crew Cab. While the previously-mentioned special-edition-versions of the Silverado seemingly focused on aesthetics, the High Desert Package will add a number of amenities that will improve the entire driving experience. For starters, owners will find that it’s much easier to store any tools or goods thanks to the inclusion of the lockable storage system. This unit will prevent any thieves from accessing your materials, and these tools will stay dry thanks to the water-resistant design. The storage boxes are also lighted, meaning drivers won’t have issues accessing the unit at any time of night. Finally, for those looking to really protect their equipment and aggregate, the three-pieced removable Tonneau cover will keep everything dry and secure. In regards to performance, the clever Magnetic Ride Control will provide owners with the smoothest driving experience around. Of course, most importantly, engineers included their EcoTec3 6.2-liter V8 engine to this specific variation of the Silverado. This specific unit can crank out an incredible 420 horsepower and 460 pounds-feet of torque, providing drivers with more than enough muscle. Best of all, thanks to inclusions like Active Fuel Management, Direct Injection, and Variable Valve Timing, owners can also anticipate an adequate fuel efficiency. While many of the previously-mentioned versions of the Silverado would presumably be able to handle any off-roading path, none of the offerings would be as capable as the incredible Silverado Realtree Edition. In fact, you’d only have to give the vehicle one quick look to determine that it has what it takes to travel off the beaten path. The interior and exterior include a number of camouflage accents, providing that adventurous persona that consumers are presumably seeking. Predictably, the vehicle has also been revised to improve its off-roading prowess. The brand included Rancho shocks, which will be better able to accommodate those uneven terrains. Meanwhile, the off-road assists steps will make it significantly easier to access your cabin. Chevy partnered with the Navy SEAL museum in Florida and the Trident House Charities Program to produce a vehicle that will help benefit the families of fallen, injured, or active military personnel. This specific version of the Silverado adds a number of cosmetic amenities that emphasize the vehicle’s SEAL-like persona, including 20-inch black aluminum wheels (accompanied by all-terrain tires), tinted windows, and an exclusive “Naval-Inspired” graphics package.